Starting in the west where you can gather round and trace your roots with the Irish Ancestry Package from Dromoland castle where you get to wander amongst the noble trees on the estate and later consult with tree experts about your family tree. And hail, rain or shine you can wash all your cares away by indulging yourself in a spa and pool treatment at Dromoland. 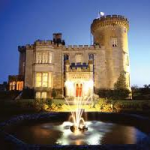 Savour that special moment as you drive through the gates to your fairytale castle getaway with one of the great breaks on offer at Dromoland Castle through Luxury Hotels Ireland this summer. You can literally savour the gastronomic delights of the castle’s fare in delicious comfort. And if the weather holds, go boldly forth onto the castle’s greens taking advantage of its golf packages on Dromoland Castle’s Championship Course. 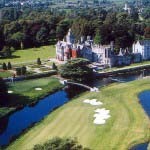 Dromoland have an engaging offer for that romantic moment if one of you finds yourself on bended knee this summer. Even the birds aim to please with the falcons prepped to drop the ring into your hand should you so wish. Just don’t leave it there too long. Lisloughrey has some great weekend break offers this summer and you can dine healthily and sumptuously on seasonal and local ingredients and release your inner gourmet. The Lodge also has plenty of family breaks when you can take in a cruise or visit the fairytale Kylemore Abbey as part of your summer holiday. 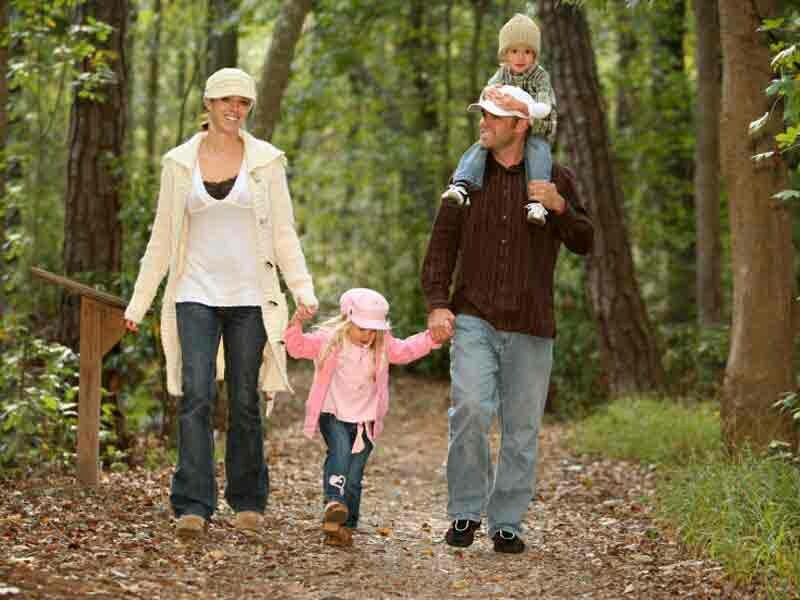 Joining in on the Gathering spirit, Lisloughrey has a special package on offer for extended family groups. The Merrion offers its Dine & Dream package to allow you sip chilled champers on arrival, nibble your way through the a la carte menu while you savour the free wine delivered t o your table and later retire to your room in luxury. Exhausting! Avoid those Monday morning blues by booking The Merrion’s Extend the Weekend offer when you get to stay over on Sunday night and wake up at your leisurely pace on Monday (or Tuesday) finaly ready to face the week ahead. One novel offering from The Merrion is the chance to spend time with a professional videographer who will record your stay in Dublin and (okay not all of it) and pop the DVD out to you after. You can further indulge your arty self with their Art of Living offer which includes a tour of The Merrion’s collection of 19th & 20th Century Irish Art hung throughout the hotel. Less soulfully, you can shop till you drop and have your shopping delivered to your room at The Merrion having availed of the BT gift voucher and personal shopper option to start with. Who said shopping is hard work? Fota Hotel offers a number of summer packages which include free entry to Fota House and Gardens, golf breaks, spa deals, golf, spa and dine deals. You name it, Fota have it. 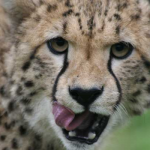 Their summer family package lets you and the kids enjoy the fun and privacy of interconnecting rooms and if things don’t work out you can check them in at monkey island next day at Fota Wildlife Park. Or if you prefer a more independent stay, check out the Fota Self Catering Lodge offers available through Luxury Hotels Ireland. Enough manic Mondays, The G offers Feelgood Friday with a hearty three-course dinner at Gigi’s sets you up for a fun filled evening in the city of the tribes. For a more sedate stay, The G also has a Pamper Perfection for Two offer to sooth, wash, buff and massage those cares away. Enjoy a Sunday snooze after the big match with Adare Manor’s offer of the same name or pull yourself together and experience all the castle and its estate has to offer as part of its Estate Activities package. All fun and games mind. Picnic baskets, treasure hunts, nature walks, fun for all the family at Waterford Castle who are offering self catering family holidays this summer when you can try your hand at tennis, croquet, boules and dare I say it even golf! The Ice House has midweek breaks, Stay & Eat offers, 24hr Escapes, a Chill Spa Escape and for the more adventurous, The Great Outdoors with horse riding, surfing or a a coastline drive to the Ceide Fields. The Lodge at Doonbeg Offers Golf packages, Time To Yourself offers where you can buff yourself down with some seaweed lotion, swim with the fishes (okay see the dolphins) or just go fishing. And for something really special, check out their Engagement offer featuring champagne on ice (cool wind in your hair) hand crafted chocolates and wait for it, rose petals. Kellys Resort have plenty on offer this summer with half board specials, SeaSpa Indulgences, and even golf Packages at either Rosslare or St. Helen’s. The Heritage is delighted to bring you its Summer Delight offer where you can stay healthy, wealthy and wise with free access to the health club. And things will look only fabulicious after you indulge in the Cocktail & The Heritage Spa Experience (not at the same time). The pampering doesn’t stop there with more opportunities to pamper your mind and body with one of their Pamper breaks. Of course if you feel the need to bring the family along, you can avail of luxurious interconnecting family rooms to stay close and then wander the vast estate to get some distance! For a Tales and Trails deal, Mount Juliet offers guided tours of the estate or I beg your pardon, you never promised me a Rose Garden, Mount Juliet offer the Rose Garden Lodge for families. Pampering is still in fashion at this luxury hotel with its Pamper Break where you can soak and float an hour so away through their Floatation Experience. You can also stay and play with a round of golf on the championship Jack Nicklaus designed course. And if you stay at the family properties at Mount Juliet, you may find it difficult to drag yourself from the comforts of home away from home but it’ll be well worth it if you do with plenty of things to occupy the little rascals while you indulge yourself in the spa. Heaven. 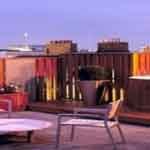 Plenty of 5 star Luxury Hotels Ireland offers only a click away. Error: Error validating access token: Session has expired on Monday, 22-Apr-19 15:56:05 PDT. The current time is Tuesday, 23-Apr-19 08:58:29 PDT.